Hi Dolls. I already wrote about summer trends of 2013, but now I wanted to show how I wear them. Starting with Crop Tops, my favourite trend. I like to pair them with high-waisted shorts or skirts. This outfits are more for the warm days, but if it gets cold I like to pair them with a basic leather jacket. And what about shoes - I always wear these outfits with my white converse or just basic white sneakers. You can't say that it is completely bohemian outfit, but it has some inspiration. It's a mixture of studded shorts (Urban outfitters), black crop top (Top Shop), chain necklace (Top Shop) to make it look edgier and an elastic hairband. I paired this DWEEB crop top from Top Shop with a denim circle skirt also from Top Shop. It is definitely one of the most comfortable outfits. It has this sporty vibe that is also on trend, but skirt makes it really girly at the same time. This look is one of my absolute favourites, I especially love the lacy detail on the top. It includes leather circle skirt from River Island, a crop top from Top Shop and a spiky necklace also from Top Shop. Next one has all the elements from other looks, but is combined in a more hip hop vibe. I also added a hairband just to make an outfit come together a bit better. This is definitely the girliest of them all. I am wearing River Island skirt, black crop top from Top Shop and a necklace from H&M. 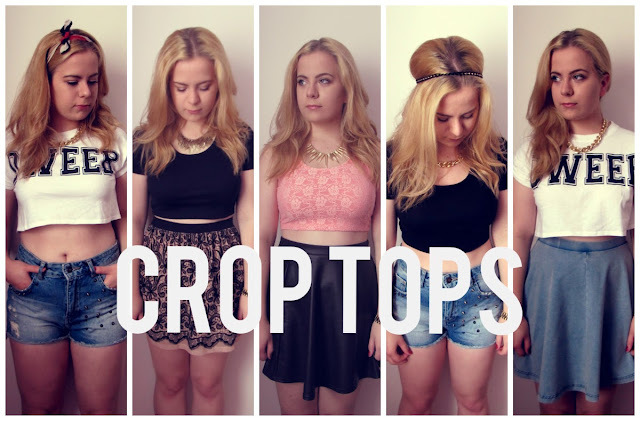 How do you wear crop tops? Let me know by commenting below. Loved seeing all the different stylings, the cropped tops really suit you wonderfully! You have the cutest sense of style! Every one of these looks is awesome.